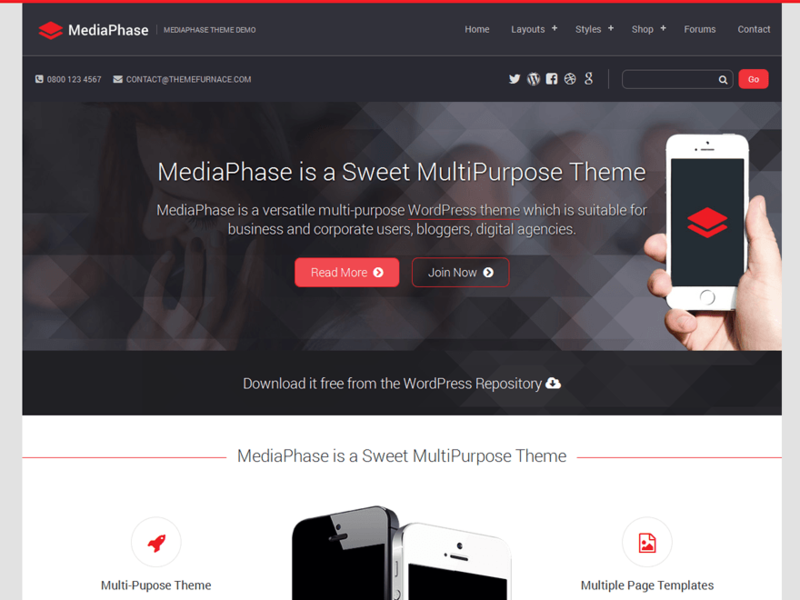 MediaPhase is a versatile multi-purpose WordPress theme which is suitable for business and corporate users, online shops, bloggers and digital agencies. It has a full-featured homepage template which is available boxed or full width, multiple blog templates so you can have a traditional blog layout or grid based layout. eCommerce capability using the WooCommerce plugin. It’s fully responsive so looks great on desktops, mobiles and tablets with a tidy mobile navigation menu. The theme makes use of the Customizer so you can set up your homepage just how you like it, from adding a hero image, call to action ribbons and buttons, features areas with fontawesome icons, about us text, meet the team widgets with social media profile links, latest news, client logos and footer widget areas. The header has space for contact details, email and phone number, a social media menu so you can link to your profiles and integrated search area. Lots of neat typography and post styling along with things like built-in pagination, breadcrumbs, default thumbnail images. Compatible with bbPress, Woocommerce, Contactform 7, Jetpack, Gravity Forms and more popular plugins. Visit http://themefurnace.com to upgrade for $49 for 17 more themes, support and more theme features.